ArrayList in java is most common Collections data structure along with HashMap which we use very often. 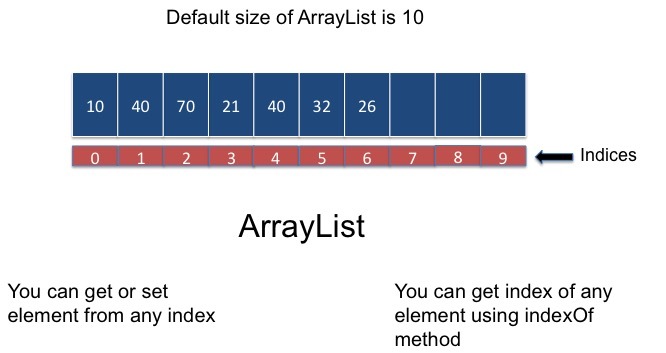 Array is fixed length data structure If array is full , you can not add element to it, where as ArrayList in java can dynamically grow and shrink as per our need. ArrayList have predefined methods which can be used to perform operations. I am explaining below method in context of String list, but you can put any object in the list. add( Object o): This method adds an object o to end of the arraylist. This statement would add a string Amit in the ArrayList at last position. add(int index, Object o): This adds the object o to the arraylist at the specified index. It will add the string Ankit to the 5th index (6rd position as the array list starts with index 0) of ArrayList. Object get(int index): It returns the object of list which is present at the specified index. remove(Object o): Removes the object o from the ArrayList. This code will remove the string “Arpit” from the ArrayList. It would remove the element of index 3 (4th element of the list as list always starts with 0). set(int index, Object o): It is mainly used for updating an element. It replaces the element present at the specified index with the object o. It would replace element which is present at index 2(3rd element in arrayList)with the value Tom. This would give the index (position) of the string Ankit in employeeNameList. If you want to merge two ArrayList, you can use this method. If you want to remove list of elements which is present in other list, you can use this method. If you want to retain only those elements which are present in Collection, you can use this method. That’s all about ArrayList in java.